Royal Vista Ranches' Dominyun was the leading first crop sale sire at the TQHA Yearling Sale on Friday. SAN ANTONIO, TX�JULY 25, 2014�TQHA Yearling Sale kicked off the major yearling auction season today (Jul 25) in San Antonio with increased results compared to last year's final figures. Multiple G1-placed DOMINYUN was the leading first crop sale sire in the first session. The son of leading sire Mr Jess Perry had two yearlings from his first crop average yearlings average $31,000. John Buchanan, Agent, purchased Hip 17 Moinet, a DOMINYUN filly out of Bovet, by Corona Cartel for $57,000. 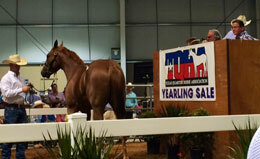 Marcelo Guerrero paid $5,000 for Red Cookie Monster, a DOMINYUN filly out of Sams First Girl, by Truly First Class. For the preliminary results from TQHA's Session 1, including hip-by-hip results, CLICK HERE. Two more DOMINYUN fillies will be offered as Hip 241 and 258 in the TQHA final session on Saturday. The sale's final session gets underway at 10:30 a.m. Saturday (Jul 26) in the in the Exposition Hall at the Freeman Coliseum. Hips 131 thru 263 will be offered.